This rare pendant or ceiling lamp was designed by Paavo Tynell and produced by Taito Oy in the early 1950s. The model number is 1092 and the lamp is marked with Taito. 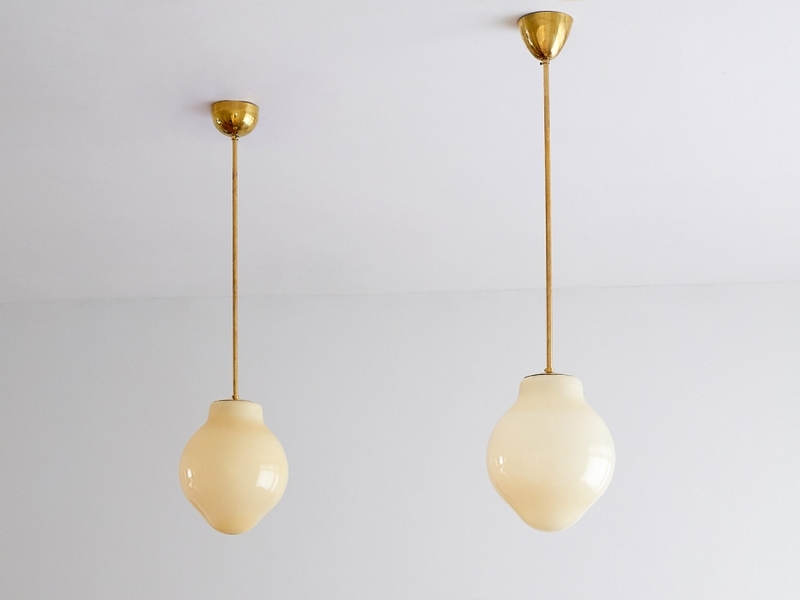 The handblown yellow glass shades provide a gentle and warm light distribution. If desired, the drop of the brass ceiling stem can be adjusted to your requirements. Literature: Idman Catalogue No. 135, 1953, page 1 Idman Catalogue No. 140, 195x, page A1-1. Condition: Excellent original condition. Please note the ceiling cups of the two lamps differ slightly.